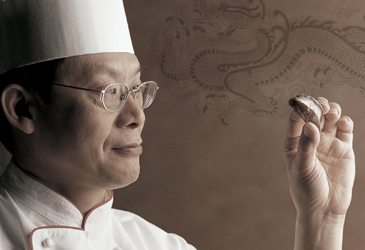 The Westin Chosun in Seoul is proud to introduce a connoisseurs of food, chef Keimei Chin frorm Japan's most famous Chinese restaurant, Ryutenmon on Sept. 20, 2005. Located in The Westin Tokyo, Ryutenmon has a sterling reputation for authentic Cantonese cuisine and now, he comes to you only at The Westin Chosun, Seoul. Head Chef of Ryutenmon since 1996, Chef Chin has become internationally famous for his unique talent in Chinese cuisine, his specialty in seafood dishes. With culinary roots stretching back three generations, Chef Chin uses handed-down traditional recipes to create Hong Kong-style cuisine that is truly Old World, while adding his own 21st century flair. For the most luxurious Cantonese cuisine, come to the Gala Dinner Feast, where you may also enter to win in the Lucky Gala drawing for accommodation certificates, dining vouchers and wine sets. For information or reservations, please call Ho Kyung Jeon at 02) 317-0494 or for other detais on the hotel give a phone call to Ms. Joo-Yeon Ahn (317-0226), a PR coordinator, or to Ms. Rae Hyun Kim (317-0455), a PR manager of the Westin Chosun in Seoul.